There are several ways to prepare your plants to protect them from the cold. Water the soil thoroughly before the cold front moves through the area. Moist soil holds more heat than dry soil. If you have an irrigation system, make sure to shut off your system or it can damage even your hardy shrubs because ice forms when it is at 32 degrees. Wrap the trunk of any grafted citrus trees with twelve to fourteen layers of newspaper, tie it at the top and bottom for any grafted trees. If tender shrubs are small, place cardboard boxes over them and if the shrubs are large place several stakes and then toss your cover over the plants. 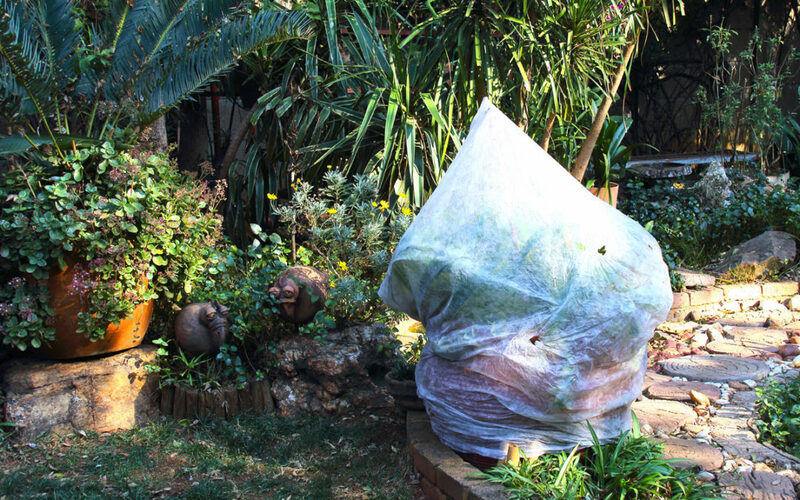 If the cover is a frost blanket, before covering your plants water well so you can trap that heat underneath to keep plants from getting damaged. Then use water to ice over the top of the blanket. This is called an IGLOO TECHNIQUE. When it gets to 18 degrees the iced cloth keeps the plants at 32 degrees. You can actually tap the cloth and it won’t move when it’s frozen. Once the frost blanket is frozen you can shut off the water because the frost cloth will stay frozen. For more information please ask for our brochure on “Dealing with Cold Temperatures”. DO NOT use plastic because this will cause the inside of the cover to lose radiated heat; therefore, it super cools the plant making the air become colder than the outside. Winds causing chill factors of well below freezing temperatures can do harm to plants also. Be sure to remove all covers and cardboard boxes after the cold is over or you can have even more damage if left on for several days and warms up to 70 or 80 degrees. If we sustain four or more hours below 32 degrees, it is important that steps be taken to help restore the damaged landscape to its natural beauty. We recommend the following action be taken as a killing frost or freeze is over. FIRST – Maintain adequate water (moisture) to the plants. Apply at least 1/2 inch of water when you irrigate. This should be done no matter how bad the lawn, trees or shrubs look. SECOND – Spray fungicide on damaged plants using the recommended dosage and one that is cleared for the use on the specific plants, such as: LIQUID COPPER, DITHANE M-45, THIOMYL and DACONIL. Applications should be made three times at the rate of the recommended dosage as found on the label. IMPORTANT: ALWAYS READ THE LABEL. THIRD – DO NOT PRUNE OR CUT BACK DAMAGE PORTIONS until danger and/or freezing is over. Bank up soil around tropical plants that have been damaged to protect them from future cold damage. This could be until mid March. For information ask for our brochure “COLD DAMAGE GARDENING TIPS”. After the cold weather and with all the damage that may have occurred ask for our brochure “After Cold Weather is Over! What Now?” this way you will be prepared in how to check cold damaged plants and how far back you will need to trim to encourage your plants to re-grow from all the damage. THIRD year cut the TOP of the tree. If you prune all over you will trim off the fruiting area. The citrus bloom and fruit on the last year’s new growth. In February they are really in pretty color this month but petal blight can devastate the beauty over night because of the rain, fog and moisture in the air. For control of this problem, spray before the heavy flowering period. Spray the flowers and the ground using DITHANE M-45 or DACONIL FUNGICIDE. Now is an excellent time to purchase azaleas to get the color you want while they are in bud and bloom. Be sure to choose a shady location, use plenty of peat and/or composed oak leaves (if you have some) to enrich the soil. Line the hole with peat, oak leaves and mix MILORGANITE in the hole. When planting spread the root ball and place the azalea no deeper than the azalea was growing in the container. Put a thin layer of mulch around the azalea, one inch only. Water daily until the azalea is established. Azaleas must be kept well watered in order to reduce any growing problems. Ask for our “AZALEA CULTURE BROCHURE” and “HOW THE DUTCHESS WAS BORN”. If your citrus trees are looking pale use CHELATED CITRUS NUTRITIONAL SPRAY. Now is the most effective time to apply the nutritional spray during December, January and February up to the time of flowering is completed. It may be used at other times when deficiency symptoms appear. (See paragraph Time to Prune) After pruning you can fertilize your trees with CITRUS SPECIAL or CITRUS-TONE by Espoma and use one pound per foot of branch spread. NEW ITEM called LUTZ SUPER CITRUS TABLETS 8-4-8 last for up to one year. Are beautiful flowers starting this time of year. Camellia sasanqua begin to flower in October thru January. These varieties are usually fast growing and very hardy to the cold and resistant to root rot. Camellia japonica will begin to flower in November thru April. These varieties are usually slower growing and very hardy to the cold. Proper location in planting will save a lot of time in the future, by fertilizing, spraying and water. Select a partially shaded area, preferably north or eastside unless natural shade is available will be the best area to plant the camellias. Organic matter is a must in the hole when planting. Such as: peat humas,or planting soil, leaf mold, cow manure or Milorganite mixed with the existing soil. It is pure folly to pay $10.00 to $25.00 for a specimen plant then plant in a 50 cent hole. Be sure to have some good air circulation or fungus and bugs will occur on the leaves. They like a well drained soil NOT wet or crown rot will set in. Pesticides used for scale or insects should be recommended after we see a specimen of an insect or diseased leaves. Apply a pre-emergent now such as BALAN, TREFLAN or SURFLAN to get that pesky CRABGRASS under control. This will kill the germination seed as it emerges. Re-apply every 90 days (12 weeks or 3 months) for continuing control. Check your lawn for fungus also this time of year damp cool foggy mornings increase this problem use DITHANE M-45 or THIOMYL. Weed and feed can still be applied. Be sure to use the correct one for your lawn. It comes in two types – one for St. Augustine grass and another for Bahia grass. You must use the CORRECT ONE for your lawn. If you don’t you could damage your lawn or even kill your grass. The pre-emergent weed killers can still be applied to control grassy weeds such as crabgrass. If you have a mixture of St. Augustine and Bahia a pre-emergent can be used in both grasses because this insures that the weed seed doesn’t germinate. Wait at least 30 days to interplant or over-seed your lawn with winter ryegrass when applying weed killers. In February is the time to prepare for a spring garden. Choose a location that has at least six hours of sunlight. The pH should be 5.8 to 6.3. SOIL PREPARATION should be done 1 to 4 weeks before planting. NEMATODES especially and other soil insects can seriously reduce the growth and yield of most vegetables by feeding in or on their roots if not treated. For Nematodes mix shrimp or egg shells in the soil prior to planting. Use PERMETROL for most soil insects. BULBS: AMARYLLIS, ANEMONES, BLOOD LILIES, CALLAS, CALADIUMS, CANNAS, CRINUM LILY, DAHLIAS, ELEPHANT EARS, GLADIOLUS, NARCISSUS, PINE CONE GINGER LILY, RAIN LILIES. FLOWERS ( H=HARDY; T=TENDER): AGERATUM-T; ALYSSUM (SWEET)-H; BEGONIAS-T; CALENDULA (WINTER-MARIGOLD)-H; CLEOME (SPIDER FLOWER)-H; DELPHINIUM-H; DIANTHUS (SWEET WILLIAMS)-H; GAILLARDIA (BLANKET FLOWER)-H; GAZINNIA DAISY -H; GERBERA DAISY-H; GYPSOPHILA (BABY BREATH)-H; HOLLYHOCK (ANNUAL)-H; IMPATIENS-T; LARKSPUR-H; LOBELIA-T; LUPINE-H; MELAMPODIUM-H; NASTURTIUM-T; NICOTIANA (FLOWERING TOBACCO)-H; PANSY-H; PETUNIAS – H; PHLOX-H; PERIWINKLES-T; RUDBECKIA (BLACK-EYED SUSAN)-H; SALVIA (BLUE PERRIENNAL)-H; SALVIA (SCARLET SAGE)-T; SORBET-H; SNAPDRAGON -H; STATICE-H; STOCK-H; SWEET PEAS -H; VERBENA-H; VIOLA (JOHNNY JUMP UPS)-H.
HERBS: BASIL-T; CATNIP-T; CHIVES; DILL; FENNEL-T; GARLIC; LAVENDAR; MINTS-T; OREGANO; PARSLEY; ROSEMARY; SAGE; SWEET MARJORAM; TERRAGON; THYME. VEGETABLES (H=HARDY; T=TENDER): BROCCOLI-H; BRUSSELS SPROUTS-H; CABBAGE-H; CARROTS-H; CAULIFLOWER-H; CELERY-H; CHINESE CABBAGE-H; COLLARDS-H; ENDIVE-H; ESCAROLE-H; KALE-H; LETTUCE-H; MUSTARD-H; ONIONS-H; PEAS (ENGLISH)-H; PEPPERS-T; POTATOES (IRISH)-H; RADISH-H; SPINACH-H; STRAWBERRIES-H; SWISS CHARD-H; TOMATOES-T; TURNIPS-H.